Former Scorpions drummer James Kottak reports that thieves have stolen more than $50,000 worth of gear from his personal storage locker. The rocker revealed the news in a series of Facebook posts Wednesday, writing “I want to thank the a@$holes who broke in to my storage unit and stole a lifetime of leather/stage clothing, 13+ guitars, etc...also, all my gold & platinum album awards, etc. Thanx...karma is coming for you but I wish you no harm and forgive you for your sins. The peeps who stole this $50,000.00+ items will be judged...I forgive you. “Mostly, my guitars are gone and I am heartbroken,” he added. “It's just things but they are memorable things. 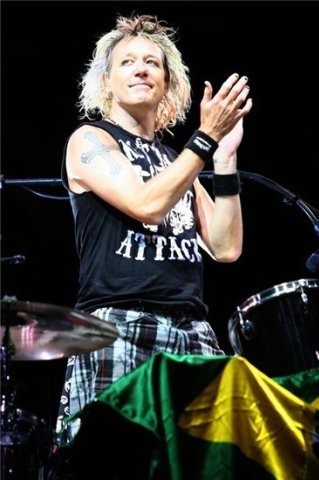 Last month, Kottak – who joined the Scorpions in 1996 – thanked fans for their support through his battle with alcoholism and his continued efforts in recovery. The drummer made international headlines in 2014 following an alleged drunken incident in Dubai that saw him spend less than 10 days in jail in the country before returning home to enter rehab. Although he rejoined the Scorpions, Kottak was eventually dismissed when the German band brought in former Motorhead drummer Mikkey Dee for their 2016 US tour before making him an official member in September.